A 67-year-old male with myelodysplastic syndrome (MDS) with complex cytogenetic abnormalities developed acute myeloid leukemia (AML) within a short period of darbepoetin-alpha therapy. He received non-ablative chemotherapy followed by an allogeneic hematopoietic stem cell transplant (male donor). His post-transplant course was uneventful and within 1 month he achieved complete engraftment. Post-transplant medications included prednisone (80 mg per day as an initial dose, gradually tapered to 10 mg), mycophenolate mofetil (2,000 mg per day initially, reduced to 1,000 mg per day at 2-month status post-transplant), tacrolimus (1.5 mg per day, starting at 2-month status post-transplant), and other drugs. An automated complete blood count (CBC) 3 months post-transplant demonstrated a Hgb of 120 g/L (reference range 137–173 g/L), white blood count (WBC) of 2.8 × 109/L (reference range 3.2–9.8 × 109/L) and platelets of 128 × 109/L (reference range 150–450 × 109/L). A concurrent peripheral blood smear showed a few unilobed neutrophils with abnormally clumped chromatin consistent with pseudo-Pelger-Huët anomaly (PPHA). In the subsequent 9 months, the automated CBC demonstrated a mild pancytopenia, but the peripheral blood smear showed continuous increase of the PPHA cells, ultimately affecting 94% of neutrophils at approximately 1-year post-transplant. These PPHAs displayed a spectrum of nuclear contours, including round (a), oval (b), coffee bean-shaped (c), reniform (d), peanut-shaped (e), bilobed (f) and other forms (g). Some PPHAs also contained detached round nuclear fragments in the cytoplasm, so-called Howell-Jolly-like inclusions (g, arrow head; Fig. 1). Eosinophils were unaffected, retaining their lobated morphology (h). A subsequent bone marrow examination demonstrated intermediate PPHA cells (i), but no other identifiable dysplasia or increase in the blasts. Conventional cytogenetics revealed a normal male karyotype (46, XY ) and engraftment analyses on the blood and marrow samples confirmed the donor origin of the myeloid elements (CD15 positive fraction). These ancillary studies excluded the possibility of relapsed or chemotherapy-related myeloid neoplasia. The neutrophils resumed their normal segmentation (j) 4 months later. Coincidentally, the clinical note stated that the tacrolimus dose was reduced to 0.5 mg per day from initial dose of 1.5 mg per day and prednisone was further tapered to 5 mg per day 7 weeks before the disappearance of pseudo-Pelger-Huët neutrophils in the routine peripheral blood smear examination. Therefore, the appearance of PPHA seemed to correlate with introduction of tacrolimus, and subsequent normalization of neutrophilic nuclear segmentation could be due to its dose reduction. Administration of multiple other medications confounds definitive delineation of the causative factors in this case. Pelger-Huët anomaly (PHA) was first described by Karl Pelger in 1928 , and was documented by G. J. Huët in 1931 as a benign autosomal dominant anomaly affecting granulocytic segmentation . This hereditary anomaly is characterized by granulocytes with abnormally condensed chromatin and hypolobated nuclear contours, which can be round, oval, peanut-shaped, coffee bean-shaped or symmetrically bilobed. Despite the morphologic abnormalities, the granulocytes are functional, thus individuals with hereditary PHA are not more susceptible to bacterial infections. Conversely, PPHA is an acquired neutrophilic anomaly with morphology resembling hereditary PHA. While its presence in some cases of myeloid neoplasms, namely MDS and AML with myelodysplasia, renders a diagnostic implication, PPHA can also be induced by many other etiologies . One of the dominant etiologies for this morphologic deviation is the increased use of transplant medications due to increased allogeneic organ or bone marrow transplants in the recent years. This neutrophilic abnormality in allogeneic transplant recipients has been reported to be associated with the use of tacrolimus and/or mycophenolate mofetil [4, 5], and the effects may be synergistic with the concomitant use of other drugs [4, 6]. The change is apparently reversible since neutrophils resume their segmentation following dose reduction or discontinuation of transplant medications in the reported cases [4, 5, 6]. Because of the conventional opinion of PPHA as a marker for myelodysplasia , the presence of these iatrogenic PPHA in peripheral blood may cause diagnostic confusion, particularly in patients with bone marrow or hematopoietic stem cell transplant for MDS/AML. Recognition of its benign nature in these cases can avoid unnecessary diagnostic intervention and medical treatment. 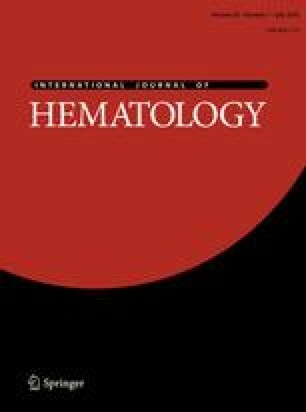 While the underlying mechanism of PPHA is currently unclear, recent identification of mutated lamin B receptor gene in hereditary Pelger-Huët anomaly  may shed light and lead to further investigation of acquired forms (PPHA), including both medication-related and the ones associated with myelodysplastic neoplasm.